This is a compilation of books about Qt published in English. For books on topics like learning C++ or OpenGL see Non-Qt Books. For books in other languages use the language switch. 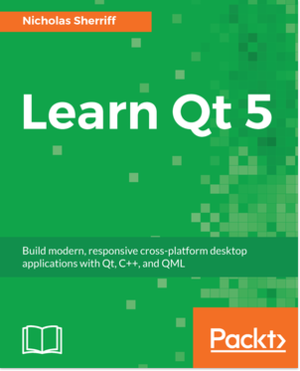 Learn the advanced of QT 5 framework to develop interactive cross-platform C++ applications using Qt Quick technology and QML. Learn the basic of QT 5 framework to develop interactive cross-platform applications using Widgets. All book content is licensed under the Creative Commons Attribution Non Commercial Share Alike 4.0 license and examples are licensed under the BSD license. 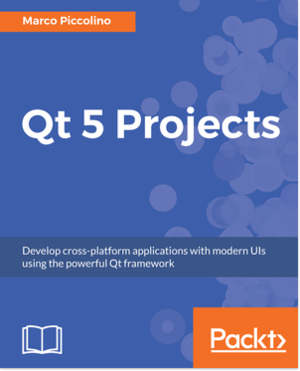 Design, build, and deploy cross-platform GUI projects using the amazingly powerful Qt 5 framework. Design and build dazzling cross-platform applications using Qt and Qt Quick. Build modern multidevice software applications with Qt Quick framework. This fully updated, classroom-tested book teaches C++ "The Qt Way," emphasizing design patterns and efficient reuse. 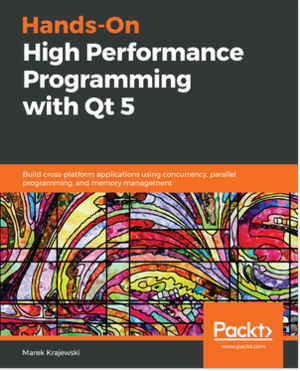 Readers will master both the C++ language and Qt libraries, as they learn to develop maintainable software with well-defined code layers and simple, reusable classes and functions. 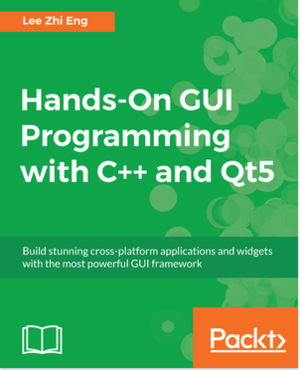 Using Qt you can build industrial-strength C++ applications that run natively on Windows, Linux/Unix, Mac OS X, and embedded Linux without source code changes. Now, two Trolltech insiders have written a start-to-finish guide to getting outstanding results with the 4.3 version of Qt. Foundations of Qt Development is based on Qt 4.2, and is aimed at C++ programmers who want to become proficient using this excellent toolkit to create graphical applications that can be ported to all major platforms. 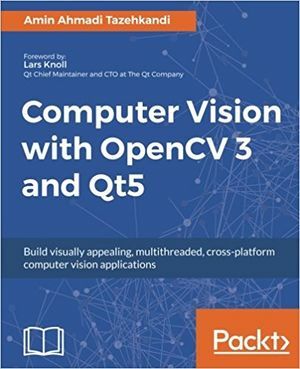 This book by Johan Thelin, a Qt Quarterly contributor and author of the Independent Qt Tutorial, aims to cover all of Qt from an independent perspective. 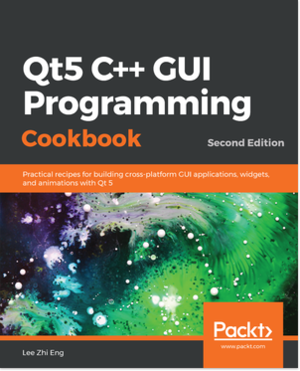 This approach allows the author to explore the use of CMake as an alternative build tool and give impartial summaries of important third-party projects based on Qt. 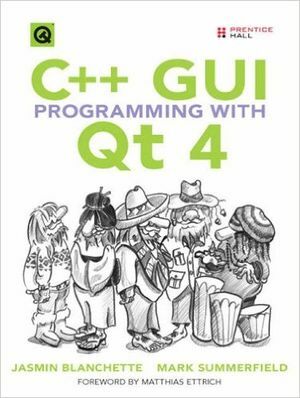 The Book of QT 4 offers an in-depth explanation of Qt 4 that goes beyond the common focus on C++ programming. Author Daniel Molkentin uses practical examples to explain features like the signal/slot concept and the event system, as he guides you through developing applications with and without Qt's graphical GUI builder, Qt Designer. 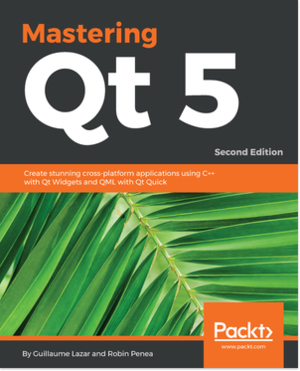 And as a core KDE developer, Molkentin's head is full of real-world problems and solutions that he peppers liberally throughout The Book of QT 4 , making it a resource that you'll consult time and again. An Introduction to Design Patterns in C++ with Qt 4 is a complete tutorial and reference that assumes no previous knowledge of C, C++, objects, or patterns. 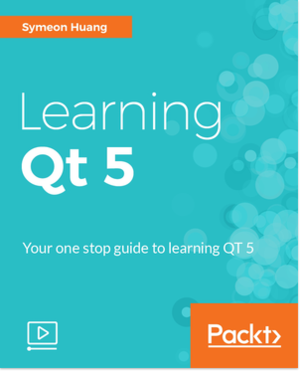 You'll walk through every core concept, one step at a time, learning through an extensive collection of Qt 4.1-tested examples and exercises. Qt 4 is radically different from earlier versions of Qt, with lots of new features and many small changes everywhere in the API. For customers porting applications from Qt 3 to Qt 4, this is bad news; but for us, this is good news, because it means that owners of the Qt 3 book will want to buy this one as well. This book provides beginning and intermediate game programmers with a step-by-step resource to desktop game programming. The reader is introdcuded into the development of a desktop game application using Qt3/Qt4/Qtopia/KDE as development platform. Desktop game relevant topics such as pathfinding, AI, sound, 2D and 3D graphics and network programming are introduced in the scope of Qt and KDE. All topics are accompanied by plenty of source code examples in the book and on the companion CD-ROM. 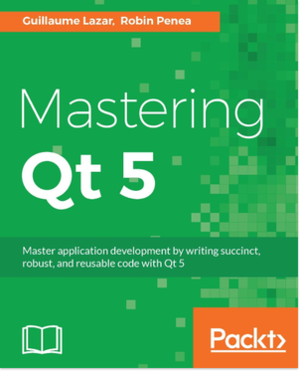 The book is written by Matthias Kalle Dalheimer, author of Programming with Qt and founder of KDAB, and Jesper K. Pedersen, a lead engineer at KDAB. It contains over 80 solutions to common problems. All solutions have the structure "problem---solution---runnable code". Take full advantage of Qt, the powerful, easy-to-use, cross-platform GUI toolkit. Completely updated for Qt Version 3.0, Programming with Qt guides you through the steps of writing your first Qt application. It's also a reference to the what, how, and why of every GUI element in Qt. And it covers advanced topics like 2D transformations, drag-and-drop, and custom image file filters. This all-in-one tutorial and reference shows beginning to advanced Linux programmers how to build graphical user interfaces for desktop applications that will run in the Windows-like K desktop environment (KDE). Expert author Arthur Griffith covers everything from simple windows and menus to dialog boxes and other advanced widgets. The CD-ROM contains the latest version of KDE. Hughes IDG has published Linux Rapid Application Development by Cameron and Tracey Hughes. This hands-on guide gives C++ programmers the tools and techniques they need to create applications based on KDE, the leading Linux graphical user interface. 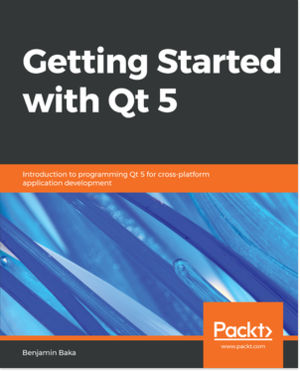 Packed with tips and advice for streamlining the entire development cycle, it explains how to harness the Qt and K Class-libraries-and build user-friendly Linux applications in a snap. The CD-ROM has Qt and KDE tools, and all code from the book. If you're ready to build great graphical applications, build them fast, and run them anywhere, this book will show you how. The accompanying CD-ROM contains the Qt 2.1 Open Source Edition distribution, value-added Qt toolkit extensions, sample code, and more. 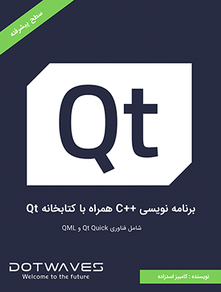 Sams has published Qt Programming in 24 hours by Daniel Solin. 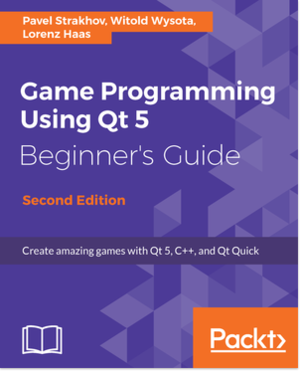 The book provides a step-by-step approach to Qt programming, and is suitable for both novice and experienced programmers. The Definitive Guide to PyQt Programming. This book by former Qt documentation manager, Mark Summerfield, teaches programmers how to write programs using PyQt4, the Python bindings for the Qt 4 application development framework. Covers PyQt version 4.2-4.6. Aimed at developers with basic knowledge of object-oriented programming, the book contains a brief introduction to Python as well as covering the wide range of GUI development features that Qt and PyQt provide. This is the first book on Python and Qt (covers Qt version 2.x and 3.0). If your chosen language is Python and you want to use Qt, this is the book for you. The main topic of this book is application development using PyQt, a library extension to the Python programming language. Please note that if you use PyQt to create closed-source commercial applications you need a valid Qt commercial license (included with BlackAdder). If your application offers programmatic access to the underlying functionality of Qt, people who use your application will also need to have valid Qt licenses. See how to use the powerful Qt3 library to create cross-platform GUI applications for Linux and OS X in Ruby. Covers installation, basic and advanced programming, event models, and Korundum. Accompanied with Qt—a cross-platform application and UI framework — MeeGo is now the target platform for Qt-based applications. This hands-on guide walks you through a series of examples to teach you how to make great devices for MeeGo using Qt's features and techniques. While media buzz regularly circulates around iPhone and Android, Nokia still leads the pack in terms of world market share. Symbian, for instance, remains the most widely used mobile operating system. With Nokia's open development platform, the opportunities available for mobile developers to target this vastly popular operating system are abundant and clear. Qt for Symbian takes a unique look at this cutting-edge programming environment. Step-by-step it explains Qt in an easy to access fashion, using simple examples throughout. This page was last modified on 17 April 2019, at 13:23.